FRESNO, CA. — Successful entrepreneur and former San Francisco 49er’s defensive back, Ronnie Lott, is scheduled to appear as the keynote speaker at the 2013 Central Valley Venture Forum on October 29 at the Lyles Center for Innovation and Entrepreneurship located at Fresno State University. Lott’s theme will be “Total Impact: Lessons from the Gridiron for Business.” The event is scheduled to begin at 10:00. Former San Francisco 49ers defensive running back, Ronnie Lott, is a popular motivational speaker, says Sports Speakers 360. 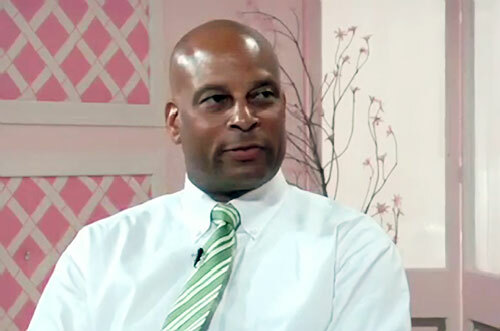 Photo shows Ronnie Lott speaking in a 2009 media interview. Lott, a successful entrepreneur who now owns several automobile dealerships and manages a multibillion-dollar portfolio of private-equity investments, is the main attraction in a daylong program that includes panels on female business leaders, growth of Hispanic businesses and how small businesses can attract investment capital. Ronnie Lott played for the San Francisco 49ers, Los Angeles Raiders, New York Jets and Kansas City Chiefs for fifteen seasons during the 1980s and 1990s. He was elected into the Pro Football Hall of Fame in 2000, and is widely considered one of the best defensive backs in NFL history. If you would like to book NFL stars or pro athletes like Ronnie Lott for a speaking engagement, personal appearance, endorsement, or corporate event, contact our booking agent for appearance and speaker fees or call 1.855.303.5450.